Humans are the most intelligent and sophisticated primates within the Animal Kingdom. However, although we are at the top of the chain, we are still animals. In fact, Aristotle classified humans as social and political animals. As animals, humans are conditioned for survival. We owe our sophistication to the complexity of the human brain with the prefrontal cortex (the seat of reason), the executor, which we use for making decisions and solving problems. We owe our instinctual reactions to the limbic system with the amygdala (the seat of emotion) and the hippocampus—the part of the brain that remembers the emotion attached to a particular experience. At any given moment, the amygdala will receive a message a little earlier than the prefrontal cortex. And that is tied in to our innate condition for survival, which is a similarity we share with other animals. We have seen how a squirrel, although indecisive at times, tries to run away to avoid being hit by a car. Similarly to a squirrel, a quick reaction by us is bound to be more effective in escaping the probability of perceived danger than taking the time to examine whether or not we may be in actual danger. The Animal in Us is a fun activity designed to remind us of our primitive reactions as a clue to be studied rather than denied. Embracing our own humanness is necessary before we can accept someone else’s humanness. •Build a wooden tray, or buy one either made of wood or plastic (approximately 20 inches long by 15 inches wide). This would be smaller than the regulation sandtray. •	Either cover the bottom of the tray with blue paper or paint it in blue (may also paint the sides if desired) to represent water/environment. o	What animal would you select to represent your Mom, Dad, siblings? o	Avoid asking “why.” Instead, ask: “What made you select this animal to represent your (Dad, Mom, and siblings)?” Give the child an opportunity to say he/she didn’t know and accept the answer. 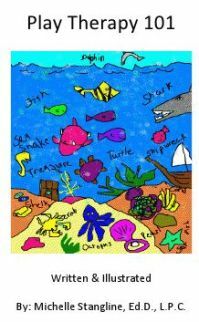 Animals can be used to represent our primitive emotions while offering a fun and safe way to encourage children in expressing themselves. 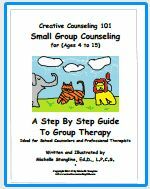 The goal in doing this activity is for children in this age group to express the feelings and thoughts they may have, but may be too young to have the cognitive ability to express. For example, children in this age group (2-7 years old) may not feel safe expressing having witnessed their parents’ anger. But, it is likely they will feel it is fun to compare their parents with miniature animals, especially after they have also compared themselves to an animal. 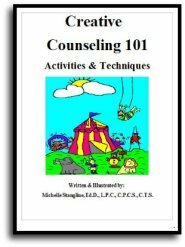 It is not likely a child in this age group will say “My parents were screaming at each other last night and it scared me.” Instead, they may be more willing to illustrate it in the sand by representing their parents with aggressive animals, such as lions, tigers, bears, or alligators. 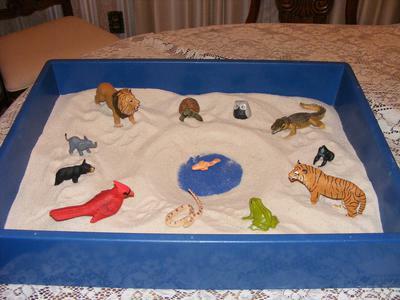 The idea of beginning the activity for the sand tray therapy is by asking the child to pick an animal to represent him/herself is based on several reasons: to ease the child into the activity, and to help the child get comfortable with using animals to represent people in the family. Because of children’s cognitive development before age 7, it is not likely we would be able to fully extract and interpret the meaning in the tray for this age group (2-7years old). But, the activity offers a glimpse into how the child may perceive him/herself within the family system. For instance, does the child perceive him/herself as a bird (in a cage) and his parents as cats or tigers? Does the child bury his representational animal in the sand? 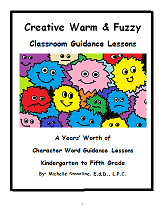 Stay with the metaphor to make it safe for the child to begin expressing him/herself. There is no need to “fix” anything; just listen and pay attention to the body language. 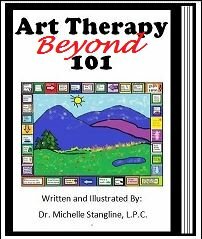 Note from Dr. Stangline: Martha Nodar was one of my sand tray therapy students at Mercer University in Atlanta. She was one of my most gifted students as a sand tray therapist. 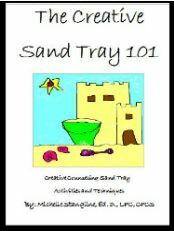 It is so wonderful to see how Martha has expanded her creative counseling skills in the sand tray for sand tray therapy. She has now become the "expert" in my opinion. As a teacher, this is one of the highest compliments... when the student becomes a master! Keep watching for Martha's ideas. She is going places!